“These were two rather physically demanding days after the two races in a row. In any case, we did a great job, starting from checks on a swingarm that we had already tested but that needed further verification. We made some changes on the chassis and the setup, both for the race on this circuit and for other tracks, gathering a lot of information that we will analyse thoroughly now. We also tested two new front tyres from Michelin, giving the techs some good indications. Overall there were some positive responses and some not so positive, but after each test we definitely have a clearer idea of which way to go in development. Now we’ll have a week of well-deserved rest and then we’ll be back on the track at Silverstone”. “We can consider ourselves satisfied with this test. We had many things to try, especially with the chassis, that allowed us to improve the RS-GP, particularly in terms of stability in braking. Yesterday and today we put together a good number of laps with rather satisfying times. We were able to take some steps forward and I am sure that the tests from these two days will be very helpful for the coming races”. 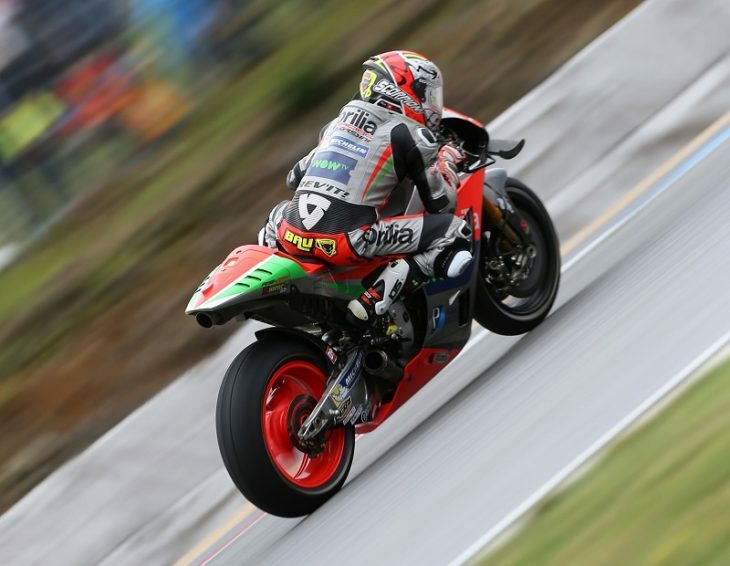 “For me this was a very good test, because we got to the point of also starting to do some tests, beyond simply getting to know the Aprilia RS-GP. For me it is never easy to get off the Moto2 bike and get on the MotoGP machine. The first day I tend to take some less than perfect lines for the way these bikes should be ridden, but the second day, even looking at the telemetry, I get close to the style of the other riders. At the end of the day the gap is not bad at all. The potential of the bike is definitely high and I am more and more happy to be part of this project”.